’Carers look after family, partners or friends in need of help because they are ill, frail or have a disability. The care they provide is unpaid‘. (1) This includes adults looking after other adults, parent carers looking after disabled children and young carers under 18 years of age looking after siblings, parents or other relatives. Carers are the largest source of support for disabled and vulnerable and the most significant form of ‘social capital’ in our communities. Effective support for carers is therefore critical for the effective delivery of both health and social care services. The national Carers Strategy, Recognised, Valued and supported: Next steps for the Carers Strategy (2) (November 2010), is currently being reviewed and a new version is expected in 2017. Based on the 2011 Census and population projections we can estimate that in 2016 there were 115,216 carers of all ages living in Surrey in 2016, this equates to 10% of the population. (3) Based on the Valuing Carers 2015 research, these carers save the public purse an estimated £1.8 billion a year in Surrey. The figure for the UK is estimated at £132 billion (4). The latest data for Surrey shows 7,430 carers getting a Carers Allowance payment in November 2015, which amounts to 24% of the total carers that care for more than 20 hours per week, and 37% of the carers who provide care for more than 50 hours per week (34). Commissioners need to ensure that the updated Carers Commissioning Plan reflects not only issues from a new National Carers Strategy but also embeds rights for carers arising from the Care Act 2014 and the Children and Families Act 2014 across the whole system. Further work will be needed to build on progress in improving identification and support for carers by the NHS, including use of a new Carers Memorandum of Understanding developed by NHS England, ADASS and others. A local implementation of this called ‘Together for Carers’ has been developed for use in Surrey (40). Taking the number of carers from the 2011 Census (3) as a percentage of the population, and applying that to future population projections, we can estimate that in 2016 there are 115,216 carers of all ages living in Surrey, and by 2025 this figure will be 124,176 (8% growth). Based on the Valuing Carers 2015 research (4), these carers save the public purse an estimated £1.8 billion a year in Surrey. The figure for the UK is estimated at £132 billion. The ‘Kids Who Care’ survey of over 4,000 school children (5), conducted for the BBC by the University of Nottingham in 2010, showed that one in twelve (8%) had caring responsibilities, equating to some 700,000 young carers in the UK – four times the number identified in the 2001 Census (175,000). Based on the projected population of young people aged 5-17 years, this suggests that in 2016 there may be approximately 14,750 young carers aged 5-17 living in Surrey. A 2016 Carers UK report, ‘Missing out: the identification challenge’ (6) suggests that carers ‘often don’t see themselves as carers and aren’t identified and as a result miss out on support’. More than half of those surveyed ‘(54%) took over a year to recognise their caring role, almost one in four (24%) took over 5 years to identify as a carer, and nearly one in ten (9%) took over 10 years’. Carers of people with mental health problems and those who are caring at a distance can take longer than average. The delay in receiving support can have a negative impact on carers’ own health and finances. Note that the majority of carers who took part in the 2011 Surrey Carers Health Survey were already known to carer networks and were more likely to care for more hours per week. A 2016 Carers Trust survey (8) found that 57% of respondents had ‘cancelled or postponed their own doctor’s or hospital appointments because of their caring role’. Carers UK’s analysis of the 2001 Census findings, ‘In Poor Health’ (9), found that those caring for 50 hours per week or more are twice as likely to be in poor health as those not caring (21% compared with 11%). This can be due to a range of factors including stress related illness and physical injury. This difference is especially marked amongst younger people. In the 18-25 age group, those providing 50 hours’ care or more per week are three times more likely to be in ‘not good’ health than people of that age group not providing care (8% compared with 2.5%). Analysis of the Census also indicates that carers providing high levels of care are twice as likely to be ‘permanently sick or disabled’ as those not caring. Altogether 316,000 people in the UK who provide care describe themselves as ‘permanently sick or disabled’, of these, 124,900 care for 50 or more hours per week. The ‘Healthy Lives Healthy People 2010’ report (10) stated that carers who care for 50 hours per week or more are 80% more likely to have health impacts. It also stated that carers providing 20 hours per week or more are likely to sustain a physical injury such as back strain. A 2014 Royal College of General Practitioners (RCGP) report (12) states that 40% of carers experience psychological distress or depression. In the 2014-15 statutory Adult Social Care survey of Carers who are known to Adult Social Care teams in Surrey (13), 53% (496 individuals) reported ‘feeling depressed’. Note that it is estimated in an Office for National Statistics (ONS) Psychiatric Morbidity report (14) that 8-12% of the population experience depression in any year, showing how much higher this is in the carer population. In ‘Ignored and Invisible – Carers Experience of the NHS’ (15) the author noted that just over half (51%) of carers reported that they had sustained a physical injury such as back strain since becoming carers and that this was considered more likely among women (54%) than men (43%). This cohort of surveyed carers was contacted through carers support organisations which are typically involved with those caring for more than 20 hours per week. This figure suggests that just over half of carers caring for more than 20 hours per week (16,070 – applying 51% to Surrey estimates) may have sustained a physical injury such as back strain since becoming carers. that problems associated with the carer contributed to readmission in 62% of cases. Feedback received by Healthwatch in Surrey (18) also supports this. One carer of an older teenage child who needs to be accompanied to frequent hospital appointments reported having to spend more than £100 on travel to take their child to these appointments, and finding it difficult to continue accompanying them there. According to the ‘Survey of Carers in Households – England, 2009-10’ (19) 46% of those surveyed were in paid employment, while 27% were retired and 13% were looking after their home or family. In total 2,400 carers were interviewed as part of the survey. In March 2014 Carers UK published ‘Supporting employees who are caring for someone with dementia’ (20) based on an employer and employee survey on the impact of working while also caring for someone with dementia. It sets out the key findings and emerging issues from these surveys. The report concludes by making ten recommendations for employers, health and social care services and government to take to facilitate better support for employees who are caring for loved ones with dementia. Taking the number of carers from the 2011 Census (3) as a percentage of the total Surrey population, and applying that to future population projections, we can estimate that in 2016 there are 115,216 carers of all ages living in Surrey. This equates to 10% of the population. By 2025 the number of carers of all ages living in Surrey is projected to be 124,176 (8% growth between 2016 and 2025). Taking the number of carers in the 2011 Census as a percentage of the population, and applying that to future population projections, we can estimate figures for 2016 and 2025. Figure 1 below shows the projected number of carers in Surrey by age band. It is widely recognised that the census undercounted young carers. The ‘Kids who Care’ survey of over 4,000 school children (5), conducted for the BBC by the University of Nottingham in 2010, showed that one in twelve (8%) had caring responsibilities, equating to some 700,000 young carers in the UK – four times the number identified in the 2001 Census (175,000). Based on the projected population of young people aged 5-17 years, this suggests that in 2016 there may be approximately 14,750 young carers aged 5-17 living in Surrey and approximately 15,790 in 2025 (see Figure 2 below). For further information on young carers, see the Young Carers and Young Adult Carers JSNA chapter here. The above charts show Surrey figures only, but if detail at Borough/District or CCG geographies is required please see the Carers data collection here. Figure 3 below shows a growth in projected carer numbers for all age groups. Compared with predicted Surrey population figures, there is a slight growth in carers, from 9.7% of the total population in 2016 to 9.8% in 2025. The percentage growth in carers numbers between 2016 and 2025 differs a great deal depending on which age group one looks at. This shows Surrey figures only, but if detail at Borough/District or CCG geographies is required please see the Carers data collection here. The impact of caring on the carer is partly dependent on the number of hours spent caring. Other factors might include whether or not a carer is in employment, and for older carers in particular there is an impact on health. The educational, social and personal development opportunities of young carers may also be affected. 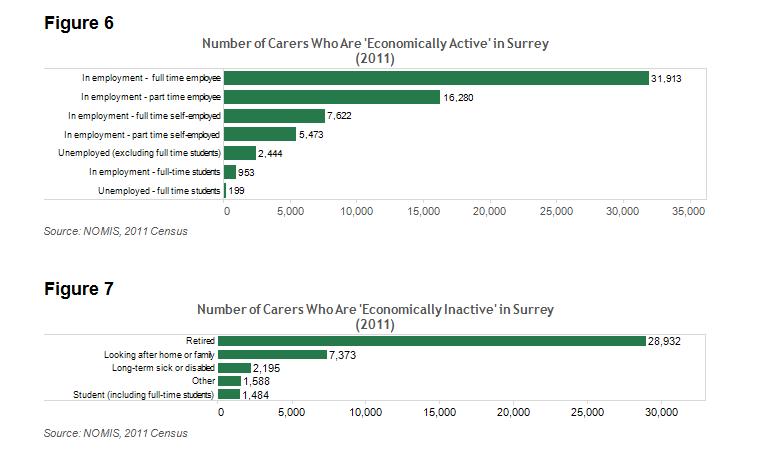 Figure 4 below shows the figures for Surrey but details at Borough/District and CCG level can be seen in the Carers data collection here. In the 2014-15 statutory Adult Social Care survey of Carers who were known to Adult Social Care teams in Surrey (13), the results showed that carers were caring for more hours than the estimates above suggest. Based on 459 responses from carers aged over 65, 69% said they supported the cared for person for 20 hours or more per week and 51% said they cared for 50 hours or more per week. There were 470 respondents aged over 65 who answered a question on how long they had been looking after someone. Of these, 57% said that they had been looking after the cared for person for more than five years. The full report on the 2014-15 statutory Adult Social Care survey of Carers who were known to Adult Social Care teams in Surrey can be found here. Figure 5 below shows a comparison of carers in Surrey by gender, age group and time spent caring per week. The figures are based on the gender split in the 2011 Census (3), and applied to projected population growth in 2016 (where possible). It is estimated that there are higher numbers of female carers in Surrey, especially in the 16-64 age group, when caring for 50 or more hours per week. Overall in the 65+ age group there is estimated to be a higher number of female carers, however in the 85+ age group there is a higher percentage of male carers. This can also be seen in the Carers data collection here. In the 2014-15 statutory Adult Social Care survey of Carers who are known to Adult Social Care teams in Surrey (13), 852 people answered a question about combining paid employment and caring. 18% said that that they were not in paid employment because of their caring responsibilities. 5% of the respondents said they were in employment but that they didn’t feel supported by their employers. The 2011 Census (3) captured data on carers who are economically active (see Figure 6 below), which means that they are either working (even if only an hour or two per week) or unemployed, but actively seeking and available to start work. The economically inactive group (see Figure 7 below) is everyone else. Please note that categories are self-defined. The above show Surrey figures only, but if detail at Borough/District or CCG geographies is required please see the Carers data collection here. Based on the 2011 Census and population projections, Surrey’s 2016 projected BAME carers population is 18,817 (16.3% of the total carers population). The Surrey Carers Commissioning Group set up a Task and Finish Group to review support offered to BAME carers, to scope current service provision, to identify gaps in service and to make recommendations. Their Report and Recommendations in June 2016 (22) noted that ‘BAME carers face particular difficulties in accessing and using support services’ and that ‘many BAME carers are unaware of the services that exist to support them.’ It identified ‘a lack of language-matched or culturally appropriate information’ as amongst the biggest barriers in BAME carers accessing services. It also noted a ‘lack of health surveillance around BAME carers in Surrey’ and that ‘people from the BAME community do not constitute a homogenous group and have diverse support needs’. If detail at Borough/District or CCG geographies is required please see the Carers data collection here. According to a 2014 report by the Royal British Legion (24), the ex-Service community is more likely to have caring responsibilities. Whilst the census data shows 13% of the England and Wales population to have some sort of a caring responsibility, this is actually 23% amongst the UK adult ex-Service community. There are four military bases in Surrey, which are home to approximately 6,200 serving armed forces personnel as well as 250 reservists and 2,400 cadets. According to the Ministry of Defence (25) in 2015 there were also 55,000 veterans residing in Surrey. Carers of veterans may face additional challenges. For example, veterans may have musculoskeletal injuries, hearing loss in a younger age group, Post Traumatic Stress Disorder, common mental health disorders and/or alcohol and substance abuse. In addition, there may be a higher incidence of post-natal depression for armed forces wives, and children whose parents have been deployed may have a higher risk of behavioural problems, stress, anxiety and depression. Surrey has a higher number of carers of people with a learning disability than in other parts of the country, owing to the historically and disproportionately high learning disability population. Surrey has a national reputation as having some of the best and most innovative carer-led services in the country. These have been developed over the last 17 years through consistent joint working with health and carers organisations. Carers are supported by a variety of joint health and social care funded commissioned support services. According to the 2015/16 Surrey Carers Commissioning Group report (28) 28,243 carers were supported through jointly funded services. However, the report also noted that ‘this figure includes carers receiving all forms of support (eg newsletters as well as direct support) and is likely to include carers counted more than once (eg if they’re supported by more than one scheme/organisation)’. The report also showed that during 2015/16 these services helped 1,545 carers who were primarily supporting a person with mental health problems, and 2,592 were carers of people with dementia. Information, advice and advocacy: the need for these is a core principle identified by carers in Surrey. Information is provided through various online sources like Surrey Information Point, the Surrey County Council website, the NHS Surrey website, the Action for Carers website or the Carersnet site. Information, advice and advocacy are also provided by all commissioned carers schemes and Surrey Welfare Rights Unit specifically provide advice to carers organisations about benefits for carers. Leisure Services: in the 2011 Surrey Carers Health Survey (7) carers identified eight of their priorities, which included improved access to physical activity and leisure facilities. Across Surrey all Boroughs and Districts now externally contract their leisure centre services. Concession card schemes are offered as part of these ‘out sourcing’ arrangements. Some Boroughs and Districts include carers in their concession card scheme although there are local differences in activities included. Carer’s Emergency Card: if an incident occurs and emergency services try to find identification on the person, this seldom tells them that there is someone at home in need of attention. The Carer’s Emergency Card tells the emergency services that the person they are attending is a carer and that there is a cared for person at home who may also need help. As part of the new GP Carers Prescription all carers prescribed a GP Carers Break now receive a Carer’s Emergency Card. ‘1 in 10 of carers (9%) in our survey used 999 or went to Accident and Emergency (A & E) because they didn’t know where else to go. Support for carers in the community is an important factor in preventing emergency admissions. GP Carer Awareness Service: the GP Carer Awareness Team sent an annual survey to all GP practices in Surrey in January 2016 in order to gather figures on carers registered with each practice. 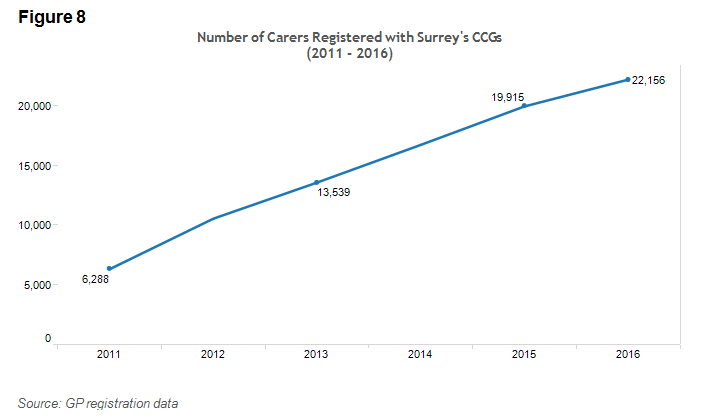 Across the whole of Surrey the number of carers known to be registered as such with their GP rose from 19,915 in February 2015 to 22,156 in February 2016, an increase of 11.25% over the course of the year (see Figure 8 below). The above shows Surrey figures only, but if detail at CCG level is required please see the data visualisation. Carers’ Flu Jabs: the Public Health England annual data collection survey 2015-16 (30) shows that the total number of carers vaccinated fell from 45.1% in 2014-15 to 37.4% for 2015-16. This is despite carer numbers increasing each year. The actual number of carers vaccinated fell by 37,000, representing a fall of more than 20%. During the season there was a general drop in uptake but in all other groups the fall was less than 10%. Carers Information Week in Surrey (October 2016) was hosted with community pharmacists and the event was used to promote carers’ flu jabs. Carers information leaflets will also be available at all hospital pharmacists. GP Carer Breaks: these provide flexible breaks/respite to eligible carers registered with GP Practices who are providing care. In 2015/16, there were 2,240 referrals received in Surrey. For further detail at CCG level see the data visualisation. Carers’ Prescriptions: these are now being used by all Surrey NHS providers and allow health staff to support carers they come into contact with by referring them to a range of support services across Surrey. The support can be provided to the carer directly, or to the person being cared for to help the carer improve the balance between their caring roles and their life away from (alongside) caring. In 2015/16 697 carers’ prescriptions were issued, almost half of which (45%) were for information. Almost a quarter (24%) were for carer support services and the rest were split between carer assessments and other services. Since the introduction of carers’ prescriptions the trend has changed from one service per prescription to an average of four per prescription. NHS Free Health Checks for Carers in Surrey 2015-16: there were fewer health checks than in previous years because of staff changes and there were fewer eligible carers (most had already had a health check within the previous five years). However, four carers support schemes or organisations took part in the health checks delivery project and organised this service for their eligible registered carers, and more are being planned for the future. The Carers Support schemes that organised events were Epsom, Guildford, Runnymede and Woking. The Carers UK State of Caring 2016 survey (17) showed that 57% of the carers surveyed said that ‘they did not feel that they had a choice about providing care to the person following their discharge from hospital’. 11% of the carers surveyed said that the cared for person was readmitted to hospital within a couple of months because they were discharged too early. This was the largest State of Caring survey carried out by Carers UK and included the views of 6,149 people. A Parliamentary and Health Service Ombudsman (PHSO) report on unsafe discharge from hospital in September 2016 (31) concluded that ‘the incidence of unsafe discharge from NHS hospitals is much too high and … is unacceptable’ and made several recommendations relating to best practice and discharge planning. Feedback gathered from Healthwatch in Surrey (18) also indicates that carers can feel unsupported when the cared for person is discharged from hospital. One carer felt let down as there was no contact from anyone to support them in looking after their relative. They said it would have been very useful to have known about support groups in their area. To help mitigate this issue in Surrey we have launched a Hospital Carers Support Service within the Royal Surrey County Hospital (September 2015) and also at Surrey and Sussex Trust (November 2015). Plans are progressing to launch a similar service at Epsom St Helier Trust and Ashford St Peter’s Trust. This service provides on the spot advice, information and support to carers of people who have been hospitalised. The NHS operating framework (32) also references the provision of replacement care for carers who have entered hospital for elective surgery. There were 8,963 carers recorded as being known to Adult Social Care teams (including integrated Mental Health teams) in Surrey as at September 2016 (33). Most carers supported by Adult Social Care are helped by supporting the cared for person. They also receive advice, information and signposting, and some carers also receive direct payments. For details of the breakdown at borough and district level, see the data visualisation. The Department for Work and Pensions (DWP) defines Carers Allowance as ‘a non-contributory benefit for men and women: who look after a severely disabled person for at least 35 hours per week, who are not gainfully employed (i.e. not earning more than £79 per week after certain deductions) and who are not in full-time education’ (35). The latest data for Surrey, downloaded from NOMIS (34), shows 7,430 carers getting a Carers Allowance payment in November 2015, which amounts to 24% of the total carers that care for more than 20 hours per week, and 37% of the carers who provide care for more than 50 hours per week. The figure has steadily risen each year since 2010 (5,400), and if historical data is projected forwards it could reach 9,370 by 2020 and 11,390 by 2025. This is a much faster growth rate (47% of the predicted 2016 figure) than the expected growth rate for Surrey carers (8% over the same period). This suggests that higher proportions of carers in Surrey will be receiving a Carers Allowance. Since 2010 only 10 young carers in Surrey aged under 18 have received any Carers Allowance. The amount that carers in Surrey receive is also increasing; from a weekly average of £53.35 in Nov 2010 to £61.53 in Nov 2015. There is very little difference in the average across boroughs/districts. Note though that carers over 65 years of age currently receive less than half the amount that other carers receive. Carers over 65 may receive a Carers Premium, which they can only access if they receive a state pension and have low enough income outside of that which allows them to qualify for pension credit. Therefore only the most economically deprived older carers would receive this. For further information please see the DWP Carers Allowance dashboard (35). The Carer Friendly Communities initiative (36) recognises organisations, services and employers where carers already ‘feel supported to look after their family or friends, and recognised as individuals with needs of their own’ and invites other organisations to commit to becoming ‘carer friendly’. Several organisations in Surrey including Surrey County Council have already committed to this. Carers UK offers a range of digital resources to carers (37), including e-learning courses, information and guidance and a mobile app (called Jointly), linking with service providers and employers. Surrey offers free access to these resources to carers who are service users or employees. Feedback from carers shows that information services for carers and breaks services are highly valued. The importance of this is reflected in the fact that the Care Act 2014 (38) includes the provision of information to carers as a statutory duty for the local authority. NHS England’s Commitment to Carers Plan (39) was launched in May 2014 at the State of Caring Conference. There are 37 commitments spread across eight key priorities which include raising the profile of carers, education and training, person-centred coordinated care and primary care. This is a hugely significant step for the NHS as this is the first plan they have ever published specific to Carers. This new plan will help inform the refresh of our two local Carers strategies and an action plan will be developed for the CCG to benchmark its performance. This has now been enhanced by an NHS England Carers Toolkit. Surrey has developed a Carers Memorandum of Understanding (40) between health and social care partners and local carers organisations. This sets out an agreement to support an integrated approach to identifying, assessing and meeting carers’ health and wellbeing needs across Surrey. In Economic Case for Local Investment in Carers Support (41) ADASS, the Department of Health and others looked at the financial consequences of ceasing support to carers. As noted in the Introduction section, based on the Valuing Carers 2015 research (4) we can estimate that carers in Surrey save the public purse an estimated £1.8 billion a year. The figure for the UK is estimated at £132 billion. The ADASS document (41) also refers to the Department of Health’s Impact Assessment on the Care Bill (42) which ‘makes an estimate of the ‘monetised health benefits’ of additional support for carers. This estimates that an anticipated extra spend on carers for England of £292.8 million would save councils £429.3 million in replacement care costs and result in “monetised health benefits” of £2,308.8 million. This suggests (as a ratio) that each pound spent on supporting carers would save councils £1.47 on replacement care costs and benefit the wider health system by £7.88′. There are co-design events planned for spring 2017 with carers, carer support organisations, suppliers, NHS and other partners to look at what works well, and what could be better, including a Nepalese engagement event. These will help inform the response to the new National Carers Strategy. The Surrey Carers Commissioning and Development Strategy 2016 -17 to 2018-19 (44) reflects the outcomes of the Government’s National Carers Strategy ‘Recognised, Valued and supported: Next steps for the Carers Strategy’ (2). The Strategy recognises the need to plan for the implementation of the future Care & Support legislation and to reflect the increase of 9% in the number of carers shown in the 2011 Census figures. The Government is reviewing the National Carers Strategy and is expected to launch a new version in 2017. Further work will be needed to build on progress in improving identification and support for carers by the NHS including use of funding provided to CCGs as part of the National Carers Strategy. In particular, more work is needed with carers in the 85+ age group, as identified in the NHS forward plan, NHS England Five Year Forward View (October 2014) (45). The new guide published by the Royal College of GPs, ‘Commissioning for Carers 2013’ (46) should be helpful in informing this work, as will the anticipated NHS England Carers Action Plan. Health and social care commissioners need to respond to rapidly growing demand for carers services that is arising chiefly due to increased levels of referrals from GP practices. carers who care for people with specific needs, for example carers of people with mental health problems. (40) Surrey Downs Clinical Commissioning Group. Together for Carers V1 – Draft Memorandum of Understanding, July 2016.